(C) ESI PHOTOGRAPHY. Dorothy Douglas and S & L Elite. Ocala, FL (February 7, 2017): Dorothy Douglas topped a field of 33 in the grand finale of the Week III at HITS Ocala. 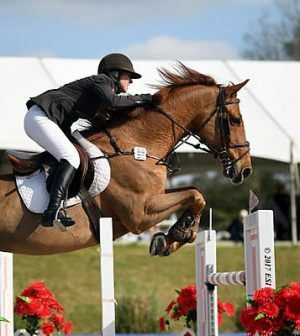 Riders and horses descended on Ocala Horse Properties Stadium in search of the top spot on the leaderboard and hopes to take home the biggest slice of the $50,000 prize purse. Douglas and S&L Elite won the class in a four-horse jump-off that kept the crowd on the edge of their seats. 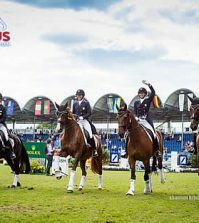 The top two brought home the only clear rounds of the jump-off and were separated by a mere fraction of a second. 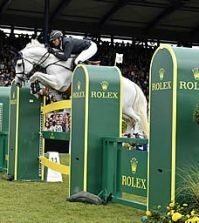 Australian equestrian Scott Keach was the first to challenge the abbreviated course piloting Fedor, owned by Southern Cross Equestrian, LLC. They had an unfortunate rail at the third fence on course, finishing the jump-off with four faults in 41.952, proving how quickly the course could be ridden. The time would ultimately be good enough for third place. Following Keach was Fernando Cardenas of Colombia riding Quincy Car. 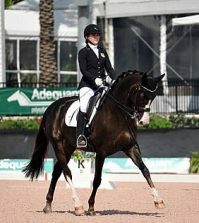 The pair won the $7,500 U Dump Junior/Amateur-Owner Classic during Week I at the Ocala winter Circuit, but they finished the week in the big leagues in Sunday’s class. Cardenas and Quincy Car crossed the timers in 44.827 with four faults after a heartbreaking rail at the final fence for the eventual fourth place. The jump-off course had yet to be mastered until victors Dorothy Douglas and S&L Elite stepped in to compete. They powered through the course, conquering each fence as they flew to the finish. 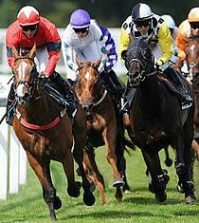 They crossed the timers fault-free in 41.051 for the eventual win. Following Douglas as the final competitor in the jump-off was Derek Braun riding Lacarolus, owned by MM Family Corp. They chased down Douglas’ time as the crowd cheered them on to the finish line. The clock stopped at 41.521, just a half of a second away from overpowering Douglas’ time on the leaderboard. Their valiant round would settle them in second place. The top five rounded out with Aaron Vale and Carlo, owned by North Face Farm. They narrowly missed the jump-off round by one time fault in the first round.